Ten a.m. this past Sunday found me in the dentist chair, getting a very large needle stuck in my gum. For so long, years honestly, I’ve put off taking care of this tooth that has gone from a small cavity to a large hole in the side. The hole only grew when I was pregnant and got worse over time. I finally reached a point where I couldn’t stand enduring the pain any more, so I went to a dentist. You can read how that went here. That particular dentist was not in full practice, however, so I went to a very modern dental clinic for a second evaluation. From the beginning I was much more comfortable with them than with the previous dentist. I had brought the kids with me (no way I couldn’t), and they kept the assistants busy – touching everything, asking what everything was, Logan showing off his loose tooth, etc. – while the doctor checked my mouth and I had a x-ray done in another room. These dentists were very helpful, reassuring me that nowadays the root canal is the better option, and that they prefer to save the tooth if it is savable, rather than pull it. They took time to explain why the root canal was better and they answered all my questions. I took some time deciding though, because pain is something I just can’t stand. I couldn’t make up my mind whether enduring the pain of a root canal was preferable to the daily ache I felt in the tooth. I’ve heard so much about how painful a root canal can be. I think one thing that helped me decide was the very friendly customer service I got from the clinic – from the next day check-in call asking how the service was, to having the dentist call me personally with answers to some more questions I had. I tried to lie still and not shake or tense my body. I had to force myself to relax, hard to do when you have to keep your mouth open as wide as possible while it is so numb you can’t feel it. My neck kept tensing up and hurting but I finally figured out how to relax it. At the end of 45 minutes, it was over. They took a mold of my mouth and are making a ceramic cap for the tooth that will be put on in a few days. And the expected pain? I don’t know if it is the painkillers I’m taking or if it really just doesn’t hurt. I’ve not had any pain. Actually, the thing that has bothered me the most in the past 24 hours is the cut on the side of my tongue that I must have gotten from one of the dental tools. I feel so much better now that it is done. No more throb or ache in my tooth. No more trying to dig out whatever particle of food happened to be stuck there at the moment. No more avoiding chewing on that side. It’s over. I hate pain of any sort. I’ve always had a very low pain tolerance level. Even a light headache will send me scrambling for a painkiller because otherwise I will be tossing and turning in bed unable to do anything. About 12 years ago I got a small cavity in the furthest molar on the bottom left side of my mouth. When I went in to have it filled, the experience was so painful that I never had it refilled when that filling eventually fell out. Then I got pregnant with Logan and the tooth went from small cavity to gaping hole on one side. And it got worse with each subsequent pregnancy. Most of the time it didn’t hurt. Other times it ached so badly I would cry. I used the excuse that I was pregnant or breastfeeding to not go, but the reality was that I was reluctant to get it fixed because of my earlier painful experience. A few months ago, the molar directly above it began hurting. Since the pain was off and on, I figured it was a cavity and I slowly worked up the courage I needed to go to a dentist. I kept putting it off, until a few days ago when the pain was so severe that I couldn’t sleep. I finally went to a local dentist and showed him the two teeth that were hurting. I had a full dental x-ray done (the machine that goes around your head and you have to bite this plastic thing and close your eyes, very weird), and the dentist showed me two things. First, the huge cavity may or may not be salvageable. A specialist will come and check it out and decide whether a root canal, filling and capping the tooth, would be best, or pulling it out. I still don’t know which I’d prefer, though I’m leaning towards pulling. Second, the tooth that I thought was a new cavity is not one. The pain I’ve been feeling that extends through my whole jaw and even to my ear is caused by an extra tooth that is up in the gum trying to push its way down on top of the tooth that is already there. There is one on the other side of my mouth as well. The only solution to end the pain? Surgery to remove the tooth! I’m freaking out at the prospect, but with a pain that doesn’t let me sleep unless I have a hot water bottle, I am ready to do it. The thought of having my mouth sliced open and having to endure days of swelling and pain afterwards is not fun. But being pain-free afterwards is worth it. Besides, I may just lose some more weight from this, being stuck on a liquid diet until I can eat without pain. I’ll probably be inhaling painkillers like candy for a while. I’ll keep you posted about how it goes. Ok, I’ll admit that when it comes to tooth care, I am not the best one to talk about it. I have not taken good care of my own teeth; actually, except for daily brushing, I’ve neglected them entirely. I don’t like dentist visits (had a painful experience once), and I actually let one of my teeth rot during my pregnancies rather than get it taken care of. Bad, I know. But just because I don’t like it for myself doesn’t mean I should ignore my children’s dental needs. If anything, I should teach them proper dental care so that they don’t have to suffer cavities like I have. When my oldest was a baby, somewhere around his second or third tooth, I decided to get him a toothbrush. Since then, I have tried to faithfully brush my kids’ teeth twice daily. Here are some things I have learned about children’s teeth care. – You have to start cleaning their teeth once they begin solids. You don’t have to clean them if they are only breastfeeding. – Use a soft bristle toothbrush that is made for babies, but don’t buy an outrageously-priced one. Those are no different from regular brushes; they are just made by companies that want your money and know you will pay any price for something that is for your baby if their logo is on it. I recently got a good one for Scarlett made by Johnson and Johnson for a decent price. Colgate has decently-priced ones too. – I remember reading about a dentist who recommended using a little gauze on your finger to wipe your baby’s teeth and gums after eating. It may work well, but if your baby is a biter (what teething baby isn’t) you may find a toothbrush will save your fingers. – Since a baby doesn’t chew its food, you don’t really have to scrub their teeth. Just gently brush them. – Toothpaste is not needed for babies. I started putting a small smidgen of it on the brush, just barely a hint of it for taste when they were past their first birthday. 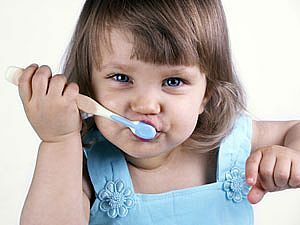 – Special children’s toothpaste is not needed, unless you are having a hard time getting your kids to brush their teeth. Mine have always been ok with the regular minty stuff. – Teach your child to spit the toothpaste out from the beginning. Most will swallow it at first, which is why I put so little to begin with, but will eventually learn to spit it out. – Let your child see you brush your teeth and they will want to do it to. – You will have to do the brushing for your child for a few years, until they learn how to do it properly on their own. Right now for my kids, I brush their teeth first, and then let them do some so they can learn how to handle the brush. Here are a few links with reference to when it is best to begin dental checkups and how to find a good pediatric dentist. Which reminds me, I’d better look into finding a pediatric dentist myself. Mommies, what has your experience been in caring for your child’s teeth and taking them to the dentist? Do you have any tips or advice you would like to share?